Built in 1909 by the prolific and accomplished architectural firm Schwartz & Gross, 210 Riverside Drive is a striking prewar co-op with twelve floors and approximately 88 units. It was designed in an ornate Renaissance style, with the emphasis on proportion and regularity evident in its symmetrical brick façade. Intricate plasterwork enhances the building, particularly its top portion, and its smooth limestone base grounds it attractively. Rising above this even base, the beige-brick facade is embellished with rusticated limestone quoins, very elaborate cartouches and decorative elements bracketing the 10th floor, textured stone piers on the 11th and 12th floors, and ornamental spandrels at the roofline. Inside the high-rise, the gracious marble lobby is highlighted by coffered ceilings and fabulous original Tiffany-style stained glass windows. You can ascend to your residence in the old-world elegance of the magnificent front elevator, with its carefully restored turn-of-the-century cab and original wrought-iron doors, operated by an attendant. Many of the apartments enjoy lovely pre-war details such as generously proportioned rooms, high beamed ceilings, decorative moldings, charming arched doorways, bountiful natural light, and unobstructed views of the Hudson River. The full-service, pet-friendly building is lovingly maintained, with a doorman, live-in superintendent, central laundry, and bicycle rooms. 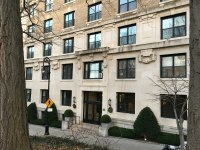 210 Riverside Drive is located on a peaceful, tree-lined stretch of Riverside Drive, directly across from Joan of Arc Park, whose focal point is the larger-than-life bronze equestrian figure of the famed French heroine and martyr. The building is just a block away from Broadway’s endless shopping and dining opportunities, and a five-minute walk from the 1, 2, and 3 trains at 96th Street and Broadway.